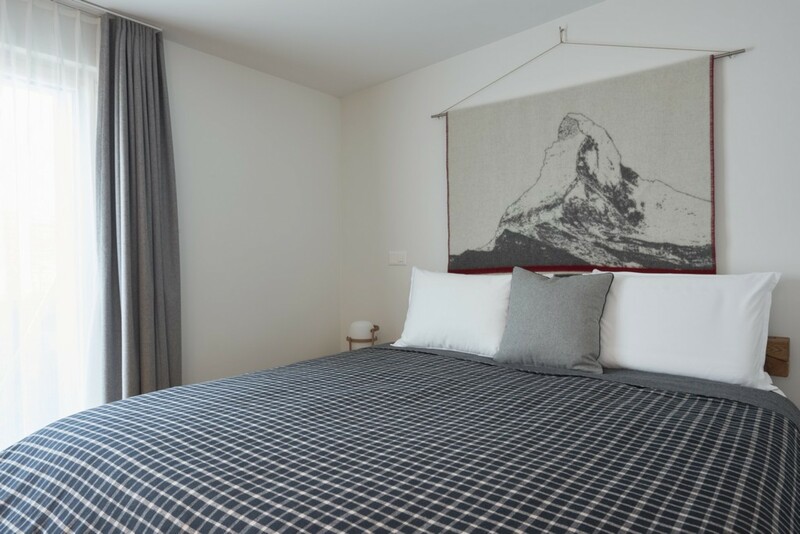 Welcome to Penthouse Tschugge, a beautiful 3-bedroom Ski apartment situated in the vibrant area of Zermatt in Switzerland. 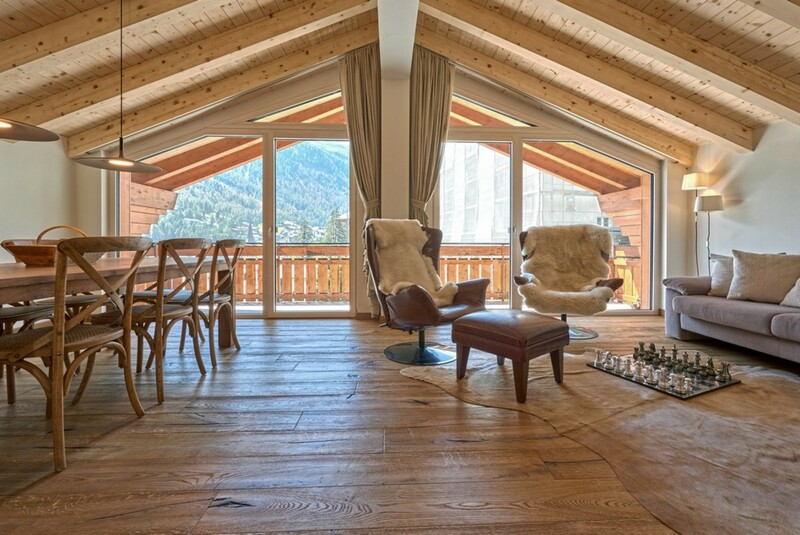 This self-catered Penthouse apartment is located in a quiet and central location in Zermatt and can accommodate up to six guests in total. The apartment is located on the top floor of a large luxurious block and has access to the large terrace on the hill above. The villa offers an array of outdoor features including a small garden with comfortable furniture, a fire pit, barbecue grill and large terrace, as well as a jacuzzi. Penthouse Tschugge provides you with a luxurious spacious apartment with views over this charming and picturesque alpine village. The location offers some of the best ski locations close by. Relaxing in your private apartment is easy. The apartment has a very cozy and homely feel. It is airy and full of light with spacious living areas. Relax on the balcony as you watch the sunrise with the sun touching the rooftops of each townhouse and cobbled street. You can prepare a delicious breakfast in the fully equipped kitchen. 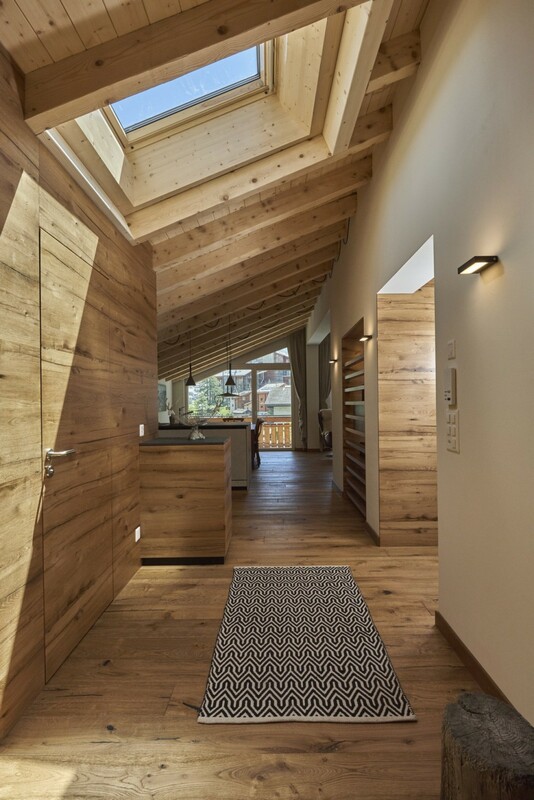 The interiors are warm and serene with pale wooden materials and underfloor heating. 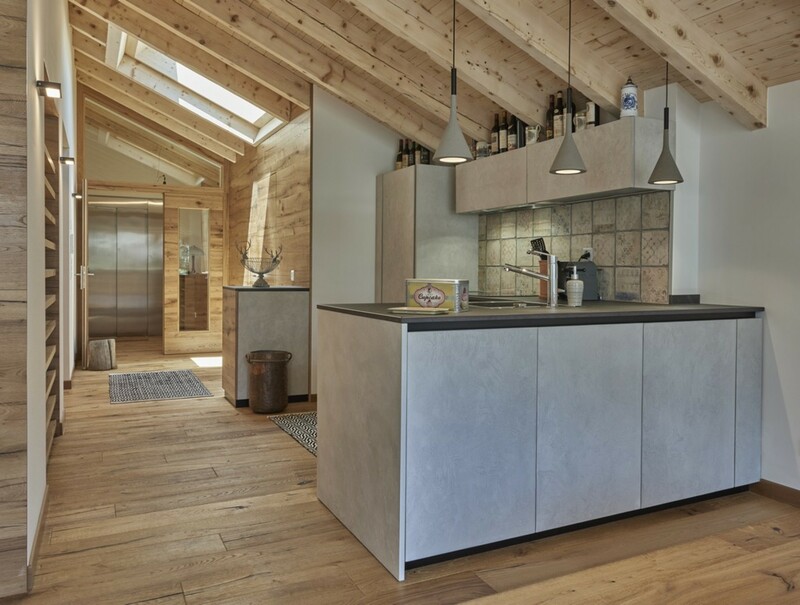 The main living area consists of an open plan living, dining and kitchen area. The huge picture windows flood the space with natural light during the day. If you like, you can light up the real woodburning fire and listen as it crackles while you read your favorite book nestled on the couch. In the evenings you can snuggle up with your loved ones, pop some popcorn and watch a film as you relax in holiday mode. Standing on the balcony you can now see the village light up in the evening and buzzing with life. Make your way to the small garden area and spark up the barbeque for some sizzling offcuts and smoky treats. You can slip into the bubbly hot tub and let your worries float away. The villa is equipped with a surround SONOS sound system and secure Wi-Fi, so you can always stay in touch with social media and all your friends. 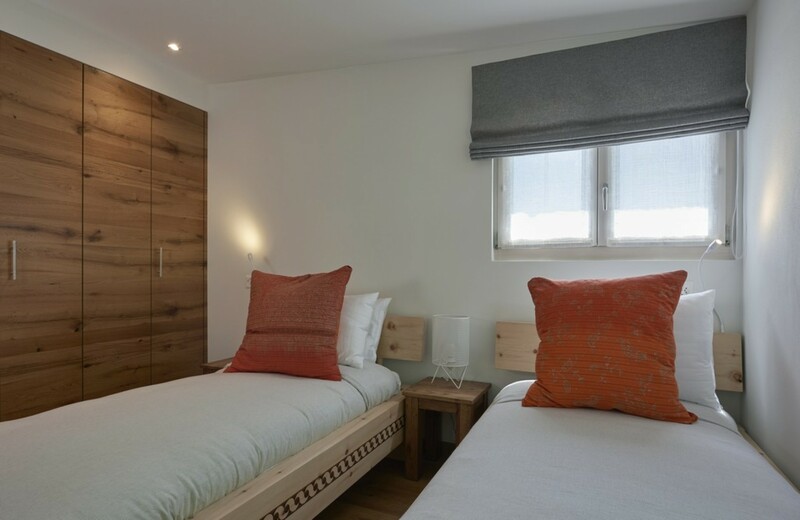 The villa includes a guest bathroom as well as a Ski room with heated boots racks, a shared washing machine, tumble dryer and large terrace. The bedrooms in the villa are extremely luxurious with handcrafted wooden beds and luxurious views of the surrounding area. 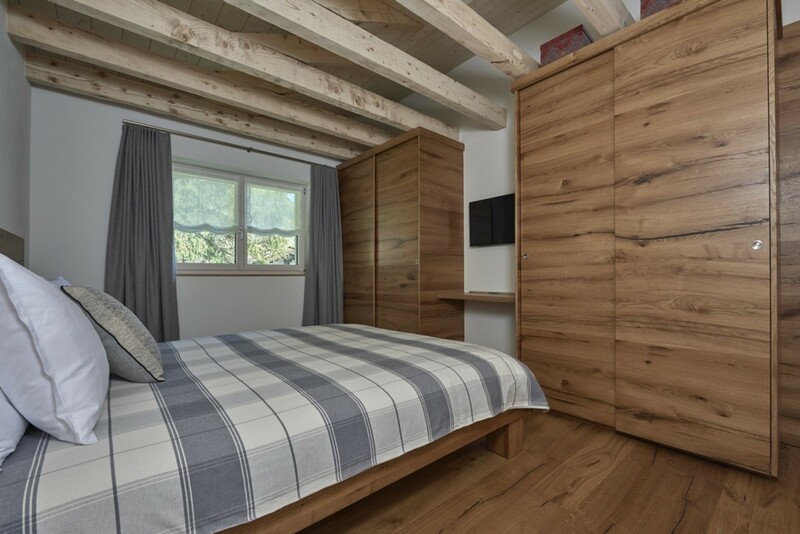 The master bedroom has a large double bed and a private Tuscan tiled en-suite bathroom with a rainfall shower. The master suite also has a built-in wardrobe and a high-resolution television. The space is decorated with beautiful artwork. 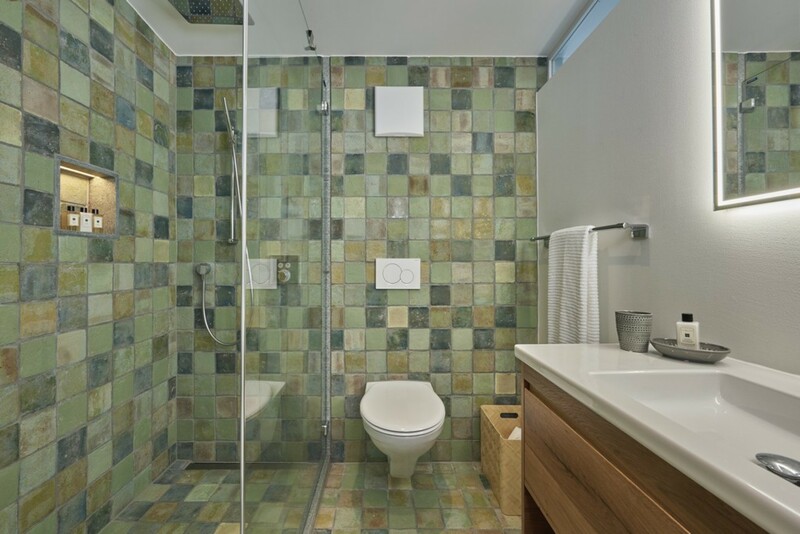 The other double bedroom and twin room share a bathroom with a Rainfall shower. Both bedrooms have wardrobe space and high-resolution televisions also. A discrete sliding door can separate the living space from the bedrooms. There is access to a South facing balcony with a grand view over the town from the villa. You can oversee the two captivating churches and the majestic mountains. 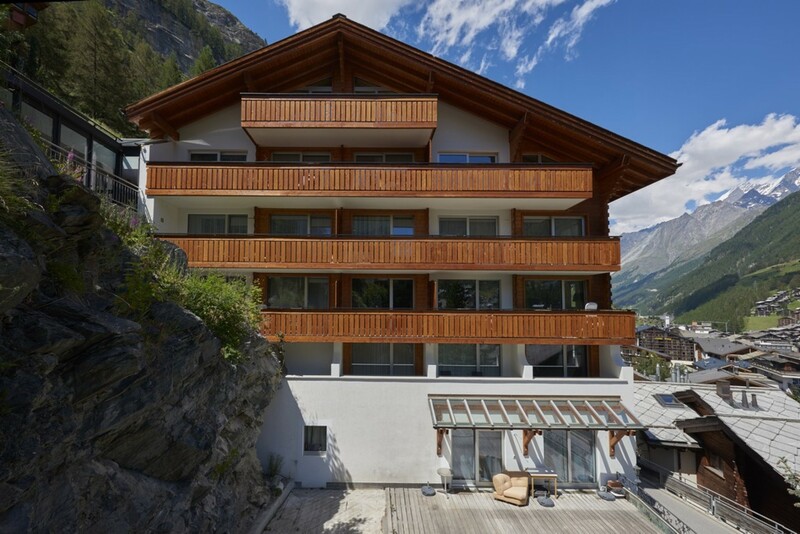 The views provided from the back are of the vast Zermatt valley and the Dom mountain in the distance. 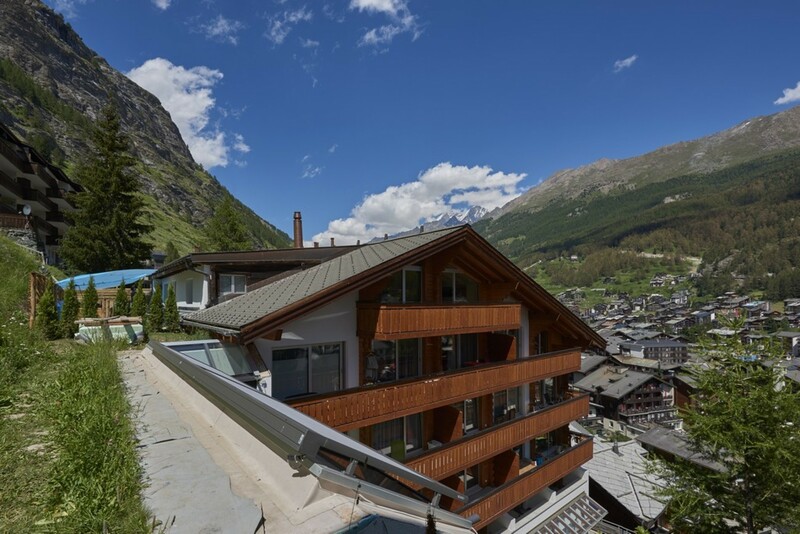 Penthouse Tschugge is located on a quiet street, Bodmenstrasse in Zermatt, Switzerland. 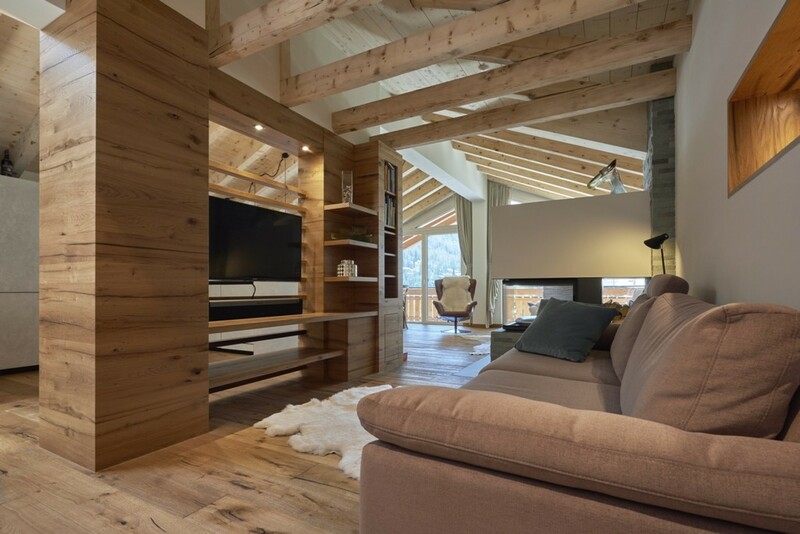 The apartment is ideal for keen skiers, and non-skiers alike. It is close to many bars, restaurants, and shops, as well as the train station and the Gornergrat railway. Zermatt itself offers incredible year-round skiing and a profusion of adventurous and inspiring activities. This small, charming and picturesque alpine village boasts of Europe’s finest ski area. 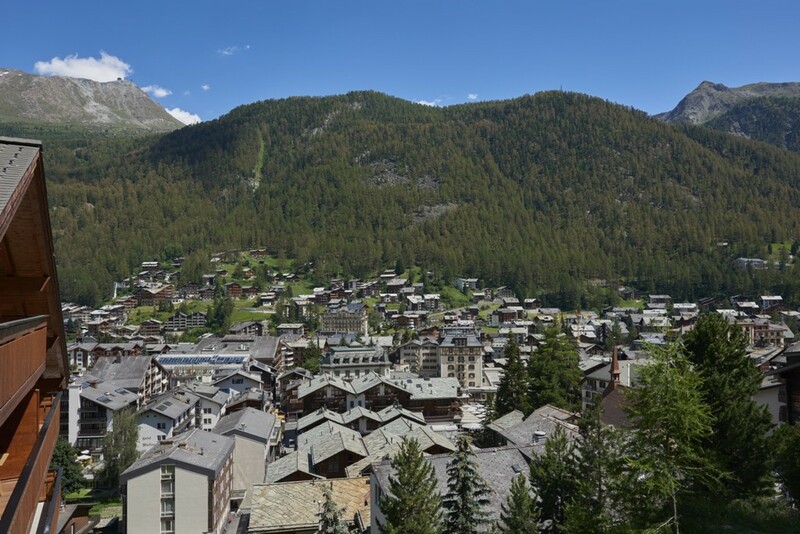 It shares 313 km of world-class piste with its neighboring Italian village, Cervinia, and is famous for its large number of gourmet Mountain Restaurants, an abundance of Après Ski and other leisure activities. Zermatt’s car-free cobbled streets, inviting chocolate shops and exclusive boutiques make it the Swiss resort of choice. 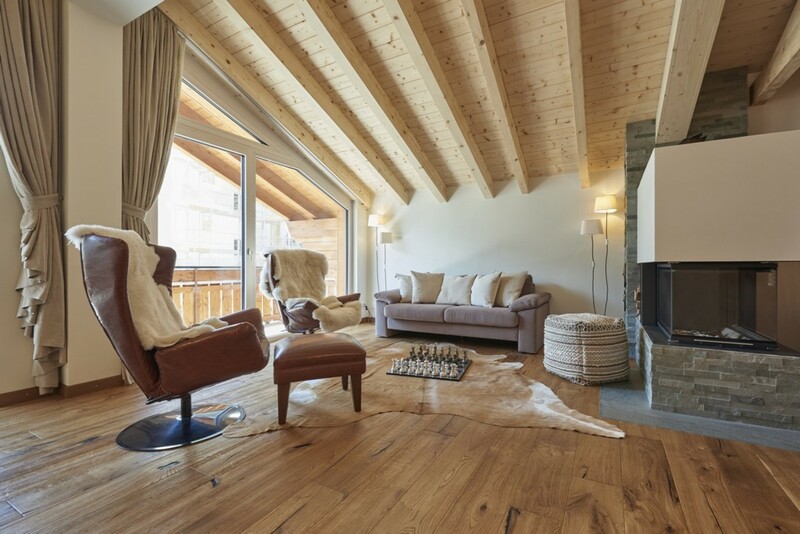 Located only five minutes from the Gornergrat train station and a short five-minute walk to the Sunnegga ski lift. The main street is only a short walk away also and holds a variety of things to do and delicious restaurants and bars. Master Bedroom 1: Luxurious Double Bed, Private en-suite bathroom, Rainfall Shower, Built-in wardrobe, High-resolution Television, Views of Jacuzzi and Garden. 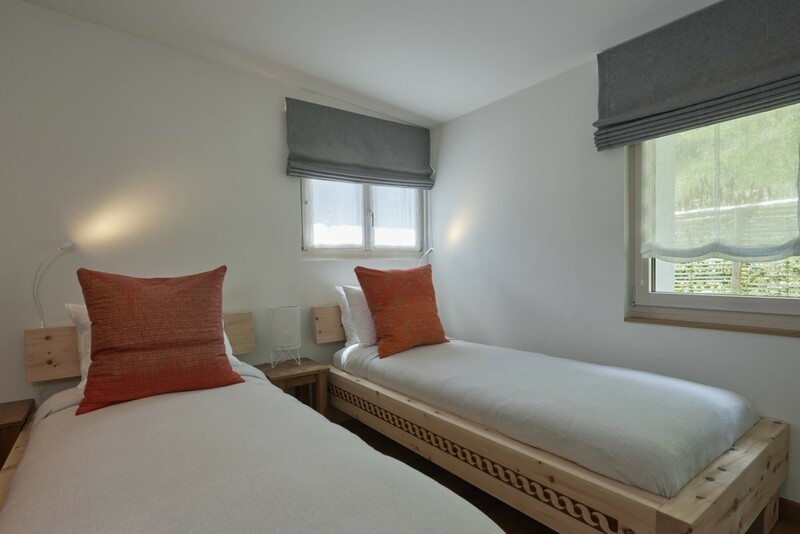 Bedroom 2: Luxurious Double Bed, Shared bathroom with bedroom 3, Rainfall shower, Large Closet, High-resolution Television. Bedroom 3: Comfortable Twin Bedroom, Shared bathroom with bedroom 2, Rainfall shower, Large Closet, handcrafted wooden beds, High-resolution Television.